Since its original release as a visual novel in January of 2004, Fate/Stay Night has become a massive multi-media property for its creators at Type-Moon. Along with a sequel visual novel released in 2005, it has also spawned five video games (two in the fighting genre and three Role Playing Games), two light novel series, one spin-off manga, four different anime series, an animated 2010 feature film, a separate, 2016 animated film for television, and a trilogy of anime movies set to debut later in 2017. None of these things should be too surprising to most anime or visual novel fans who know how well these two fields of entertainment complement each other. It’s also not too surprising for a spin-off game to become popular enough in its own right to warrant its own series. However what might be surprising is to find out that one of those spin-off games is becoming a theatrical stage production. 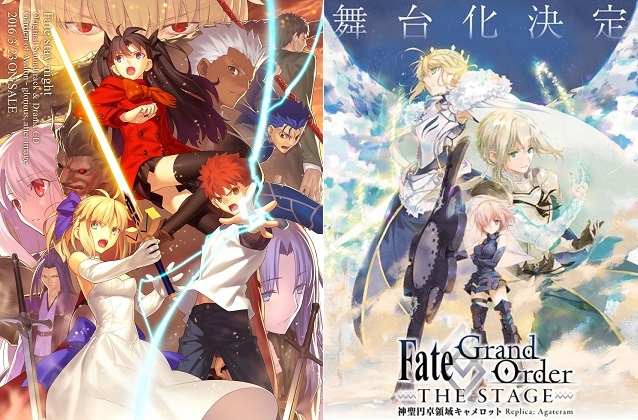 Mobile phone game, Fate/Grand Order has already received an animated adaptation in the form of the previously mentioned 2016 film, but is now going to be transformed into a live play. Set to run from July 14th to July 17th in the Tokyo Zepp Blue Theater in Roppongi, the script is to be based off the Camelot quest segment of the game. An official Twitter account for the project was created in March of 2017 but has only provided nominal details on the project, though more information is promised to be forthcoming. Many anime have received audio dramas to expand their stories, but far fewer have received an actual live play. Given the popularity of the Fate/Grand Order game and the overall franchise, it could easily have enough of a following to make this production successful. Live theater is a tricky medium; one where mistakes and errors can’t be edited out, and production techniques and special effects are far more limited in scope. It’s those very same caveats though which also make live performances once in a lifetime opportunities. We’ll wait with baited breath to see how things come together when the curtain lifts on July 14th. Would you see a live theatrical adaptation of an anime or game? Are there any story lines you’d like to see brought to life in this way?